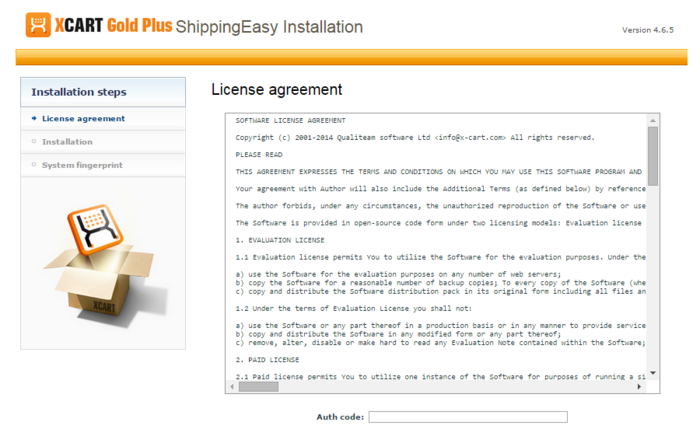 To be able to successfully install and use the ShippingEasy module, you need a working copy of X-Cart version 4.4.x installed on your server. 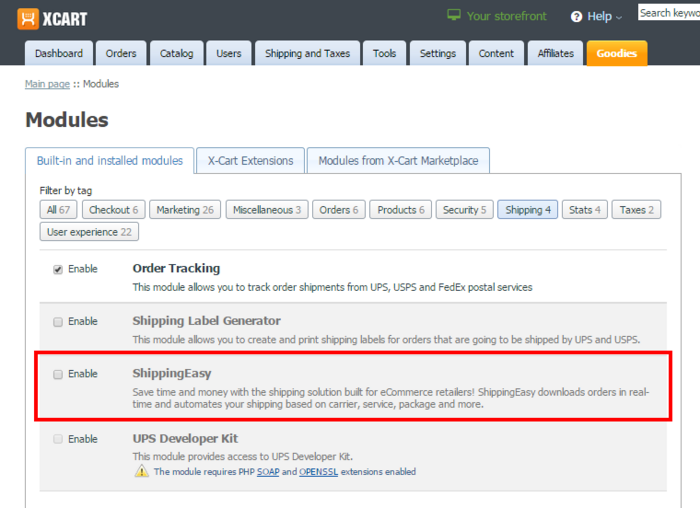 Download the ShippingEasy module archive from the File Area section of your X-Cart Account. Look for a file named like x-shippingeasy-x.y.z.tgz, where x, y and z are numbers matching the version of your installed copy of X-Cart. 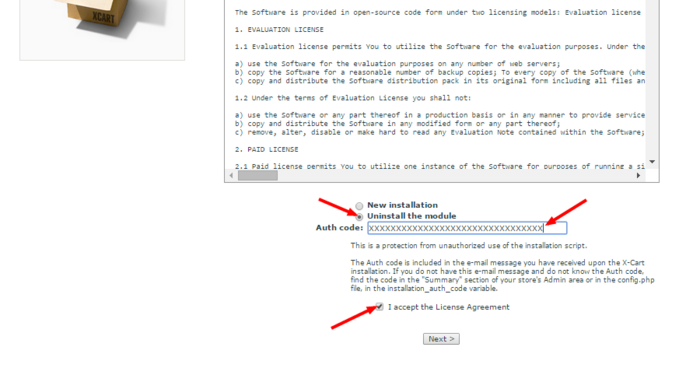 Copy the contents of the module archive to the X-Cart root directory on your server or hosting account. a) Unpack the module archive to a directory on your system using your favorite compression program (WinZIP, 7-Zip or any other archiver with support for TAR files). b) Use an FTP client to upload all the files contained in this directory (retaining the directory structure) to the X-Cart root directory on your server or your hosting account. 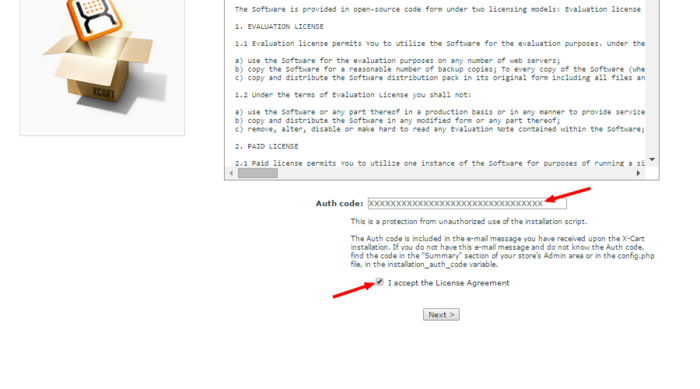 a) Use an FTP client to upload the module archive to the X-Cart root directory on your server or your hosting account. (Replace x, y and z with the actual version numbers). Important: Make sure you keep the directory structure while unpacking and uploading the module archive, otherwise some necessary files may be overwritten! Make your selection (Yes/No) and click Next. If you have chosen to generate a new system fingerprint, it will be generated. The process of generating a system fingerprint may take up as long as a few minutes. Once the generation process is completed, click Next. If you have chosen to skip the generation of a system fingerprint, you will be taken to the next step. This is the final step. 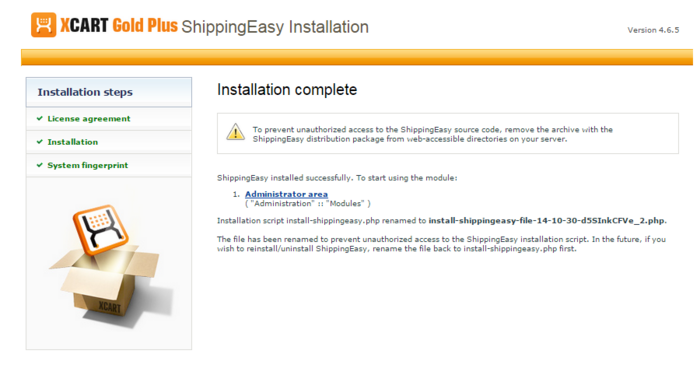 It informs you that the ShippingEasy module has been installed successfully. It also reminds you to remove the module archive file in case you put it in a web accessible directory; this is needed to protect the module from unauthorized copying. 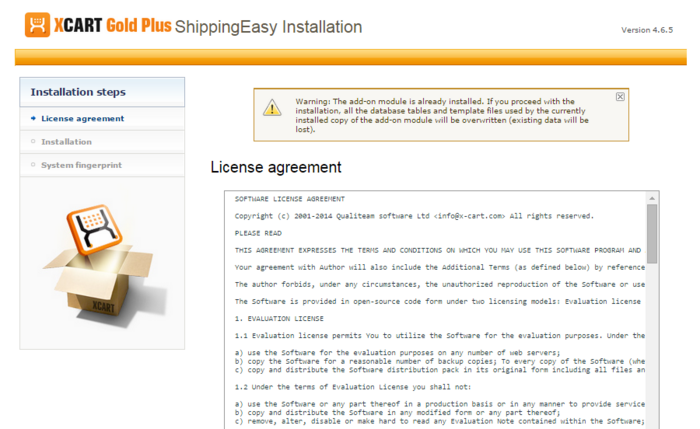 Important: At the final step of the installation process, the installation script install-shippingeasy.php is automatically renamed as an additional measure to protect the module installation. 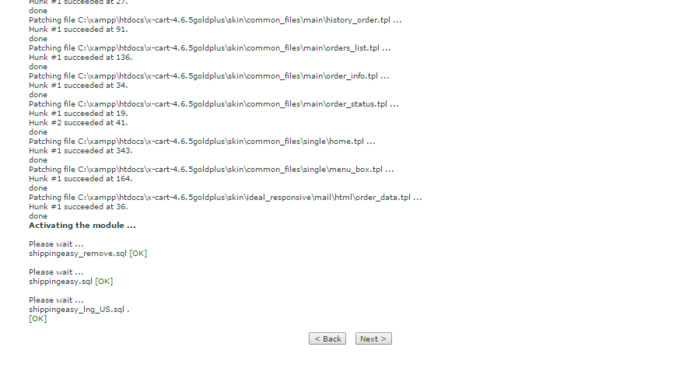 Please take note of the filename to which the installation script was renamed. 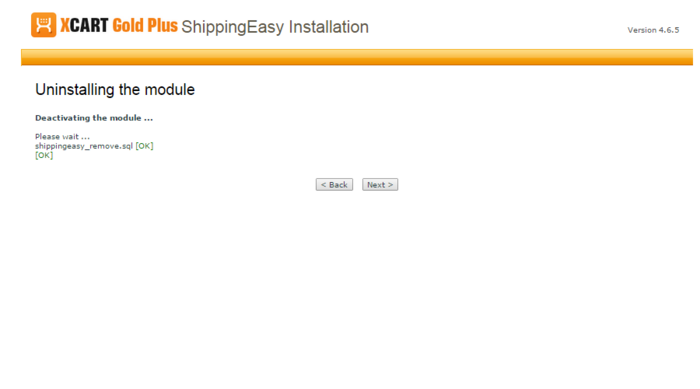 If you decide to re-install or uninstall the module later on, you will need to rename the installation script back to install-shippingeasy.php before launching the installation process in your web browser. This is all. 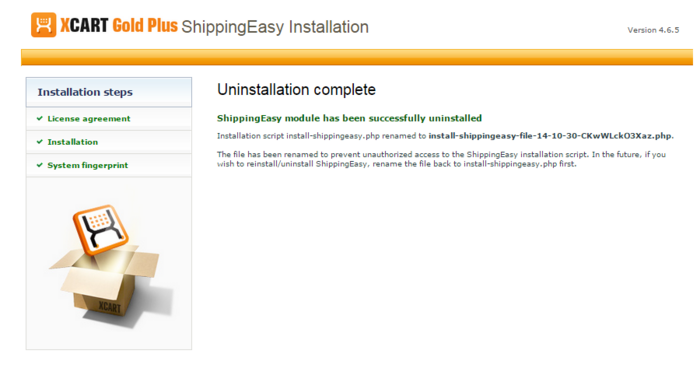 The ShippingEasy module has been uninstalled. This page was last edited on 21 January 2016, at 17:03.